Guillaume Côté as the brilliant, yet troubled dancer Vaslav Nijinsky, March 2013 (Bruce Zinger). TORONTO—”Nijinsky” is a look inside the mind of a madman, but when that madman was one of the greatest ballet dancers in the world, it makes for a compelling subject. At one time, Vaslav Nijinsky captivated audiences with his gravity-defying leaps, incredible strength, and artistic persona. He soared in classical ballets, yet also caused vivid controversy with new choreographies that pushed the boundaries of tradition and morality. Nijinsky was not yet 30 years old when he gave his last performance in 1919, yet he had already fascinated the imagination of ballet lovers and dancers through his remarkable artistry and innovative spirit. Choreographer John Neumeier was deeply enthused by Nijinsky, studying his life and dance in fine detail, culminating in the work he introduced with the Hamburg Ballet in Germany in 2000. The ballet he created is a tribute to the man and the dancer, yet it is not a tribute in a conventional sense. Audiences see glimpses of Nijinsky’s famous roles, his family, friends, and lovers, which provide a somewhat biographical look at the real person who once lived, breathed, and danced. Yet they also go inside the mind of the disturbed man, where reality and illusion mix, and where time and space become suspended and intermingled. “Nijinsky” is a difficult ballet to watch. For one, it is a painful journey that follows a man who has lost control of his thoughts and his life. For another, the ballet follows a disjointed, fragmented narrative that takes the audience into the dancer’s madness, without much attempt to make sense of it. It is painful to watch Nijinsky and his world as they come crumbling down and as his mind is overtaken by despair. Yet the ballet has beauty, too. It is apparent in the scenes in which Nijinsky’s wife Romola stands by him in his madness. Romola, who was once obsessed with the brilliant dancer, comes to show incredible strength and compassion as she fearlessly steps in to take care of the broken man. There is beauty in the artistry of the National Ballet’s dancers, who show remarkable skill and passion in performing the technically and emotionally demanding ballet. There are also moments of unexpected joy and relief as the dark world lights up momentarily with a brilliantly choreographed moment of dance. The music is a good companion to the ballet, ranging from the romantic melodies of Chopin, Schumann, and Rimsky-Korsakov to the heavy and at times dark and strident notes of Shostakovich. 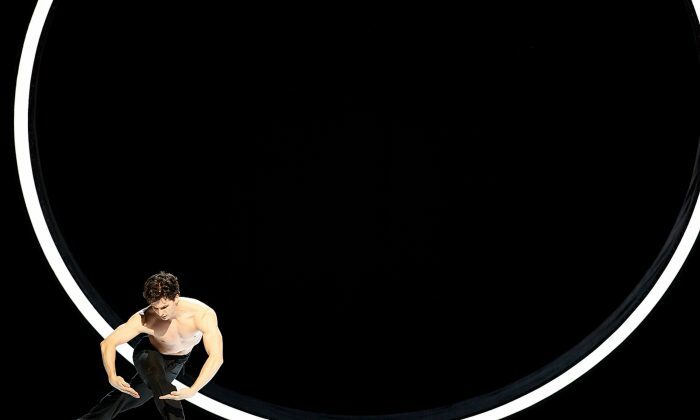 “Nijinsky” challenges the audience to find meaning in the pain and the darkness of the dancer’s world. Indeed, there is not much romance or fantasy to hide behind. The ballet is a harsh reminder that an out-of-control life is chaotic, dark, and sad. Yet “Nijinsky” also provides a good opportunity to reflect on our own path in life—what is good, what is meaningful, what we are willing to give up. For this alone, one could say Neumeier and the National Ballet have presented an outstanding work.